With the VXi BlueParrott B250-XT Bluetooth Headset you can answer and make calls with clarity. The headset features 95% Ambient Noise Suppression and 6mm bi-directional noise-canceling microphone. With 66-Feet wireless range, you can talk wherever you are, even if far from your smartphone. You can also make your phone a walkie-talkie with the VXi BlueParrott App. Push to talk to one person or a group on Android or iOS phones. Dimensions (L X W X H): 10.375 x 7.5 x 2.25"
The MobileSpec MSCVCMICRO features a micro-usb connector and can power up 12 Volts DC. You can in your car charge any electronic devices with micro-usb port such as Blueparrott's B250-XTS, B350-XT, B450-XT, and S450-XT. The charger includes an 8-feet cord and universal adapter socket. Additional 5-Pack of Blucoil Cable Ties to complete your bundle! WIRELESS COMMUNICATION - Compared to other products, the VXi BlueParrott B250-XT Headset has a wireless range of up to 66-Feet. Now you can answer and make calls wherever you are. The Bluetooth feature allows you to answer phone calls and also hear your navigation app simultaneously. XTREME NOISE SUPPRESSION - Now you can make and answer calls without worrying about ambient noise overpowering your voice. The B250-XT Headset has 95% Ambient Noise Suppression and 6mm bi-directional noise canceling microphone. SECURED CONVERSATIONS - The VXi BlueParrott B250-XT Bluetooth Headset keeps all of your conversation private with the 128-bit digital encryption. You can talk up to 16+ hours or put it on standby up to 150 hours. 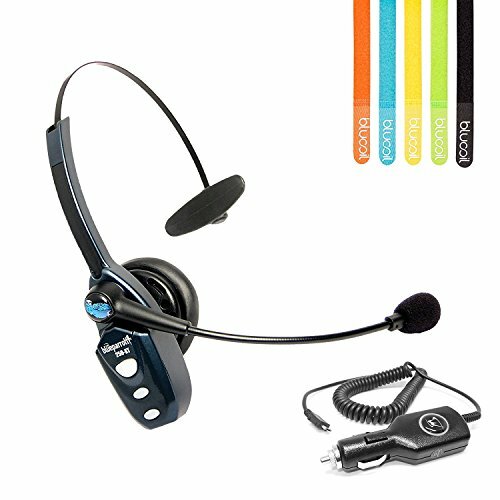 COMFORTABLE ROADWORTHY HEADSET - You can wear the B250-XT all day, every day without any discomfort. The headset is incredibly lightweight (2.52 oz) with adjustable headband and flexible boom mic, which you can customize for a stable fit.